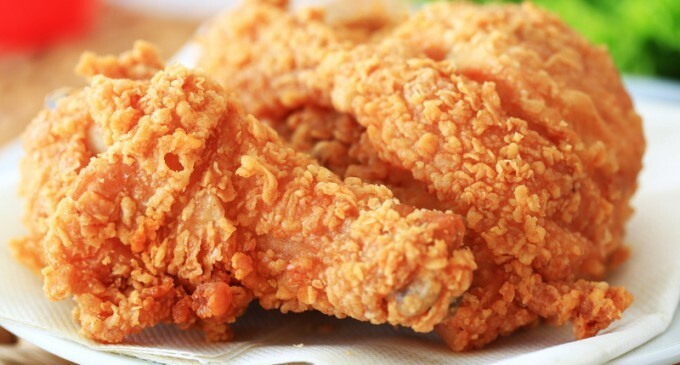 Stop Burning Fried Chicken: We Have The Special Batter & Method That Makes It Come Out Perfect! Here's everything you need for the crispiest fried chicken you've ever tasted. This recipe requires just 10 minutes of prep time and 10 minutes of cooking time, and makes 8 hearty, savory servings. Start by taking a resealable plastic bag and combining 2-2/3 cups flour, garlic salt, paprika, 2-1/2 teaspoons pepper and poultry seasoning in the bag. Next, beat the eggs and the water in a shallow bowl, and then the salt, flour and pepper. Use this mixture to coat each piece of chicken by placing the meat in the bag, and then closing the bag and shaking it so that the meat is completely coated. Next, heat oil to 375 degrees Fahrenheit in a deep-fat fryer and then fry a few pieces of chicken at a time, cooking for 5 or 6 minutes on each side. You'll know the chicken is done when it's golden brown and its juice is clear. Then, simply drain the chicken on paper towels and it's ready to serve. This recipe definitely makes us want to pack up the picnic basket, load it with goodies, and head on out to the nearest park for a picnic with family and friends. Richard Stewart maybe this will work for your chicken. Mmm, delicious—will make this next time I have chicken.